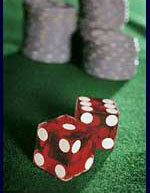 Players can generally find a minimum of 250 different games at any of our top-rated online casinos. Microgaming powered casinos tend to be packed with somewhere in the region of 700+ games, but to access this entire portfolio of games you would need to install the Microgaming casino download client on to your computer. Microgaming’s instant Flash casino platform contains approximately half as many games. The main game categories available at any online casino today will include Online Slot Machines, Online Table Games, Online Card Games, Online Video Poker and Instant Win Games/Speciality Games/Parlour Games, the latter of which will include games such as Online Bingo, Online Keno, Online Scratchcards and one or two Arcade Games/Asian style Games, as well as Hi-Lo Games and Numbers Games. The main types of Table & Card Games which are now widely available online today include Online Blackjack, Online Baccarat, Online Casino Hold’em, Online Roulette, Online Craps, Online Caribbean Stud Poker, Wild Viking, Red Dog, Sic Bo, Tequila Poker and Stravaganza, plus one or two other games. You can also now find multiple versions of Blackjack & Roulette. Some of these varieties include American Roulette, European Roulette, French Roulette, Double Bonus Spin Roulette, Triple Bonus Spin Roulette, 3 Wheel Roulette/Multi-Wheel Roulette Gold, Expert Roulette, Newar Roulette, Video Roulette, Mini Roulette, 3D Roulette and Marvel Roulette, plus one or two other varieties. You can also now find multiple Blackjack varieties, some of which include Perfect Pairs, Blackjack Surrender, 21 Duel Blackjack, Double Attack Blackjack, Pontoon, Blackjack Switch, Blackjack Peek, Lucky Blackjack, Atlantic City Blackjack, Vegas Strip Blackjack, Spanish Blackjack, Multi-Hand Blackjack, Double Exposure, Hi-Lo 13 Blackjack, Super Fun 21 and Win Win Blackjack. With Video Poker, some of the most popular varieties include 10’s or Better, Jacks or Better, Pick’em Poker, Aces & Faces, Mega Jacks, Joker Poker, Deuces Wild, 2 Ways Royal, Double Double Bonus Poker, All American, Aces & Eights and Triple Play Draw Poker. You can find more than 50 different Video Pokers online today. Don’t forget that you can also find single hand video poker varieties and multihand video poker varieties (usually up to no more than 100 hands). Some of the other most popular casino games available online today are the Progressive Jackpot Games and the Online Slot Machines. Online slots generally come as Classic Slot Machines (with 3 reels and 1 winning payline) or Video Slot Machines (with 5 reels and multiple paylines). Branded online slot machines also tend to be the most popular of all online slots. Some of the most famous online slot machines from Microgaming, Playtech and NetEnt include (in no particular order) Game of Thrones, Avalon II: The Quest for the Grail, Jurassic Park, Terminator 2, Battlestar Galactica, The Dark Knight, The Dark Knight Rises, South Park, South Park 2, Gonzo’s Quest, Mega Fortune, Aliens, The Avengers, Captain America, Thor – The Mighty Avenger, Beach Life, Gladiator Jackpot, Monty Python’s Spamalot, Iron Man 3, Pink Panther and The Incredible Hulk.